She certainly took some risks with it – despite having the obvious hit single of the title track lying around, she chose to announce her return with Frozen, a six minute, broken hearted trip-hop song. It was a masterstroke, it reached No 1 in the UK, and No 2 in the US. Madonna was well and truly back. It set the tone of the album too. Largely informed by her break up from Sean Penn, it is, despite the brilliant pop effervesance of the title track, largely a sad album, you only need to look at the track titles – To Have and Not to Hold, Drowned World, Nothing Really Matters – but the centrepiece of the album is the incredible One-Two punch of Frozen followed by The Power of Good-bye . The former a song of pleading “if I could melt your heart/we’d never be apart”, with a small hope, immediately followed by a song that smashes that hope. Madonna’s most brilliant ballad, The Power of Good-Bye sees her recognise that the relationship she’s in is failing and that it is time to walk away. 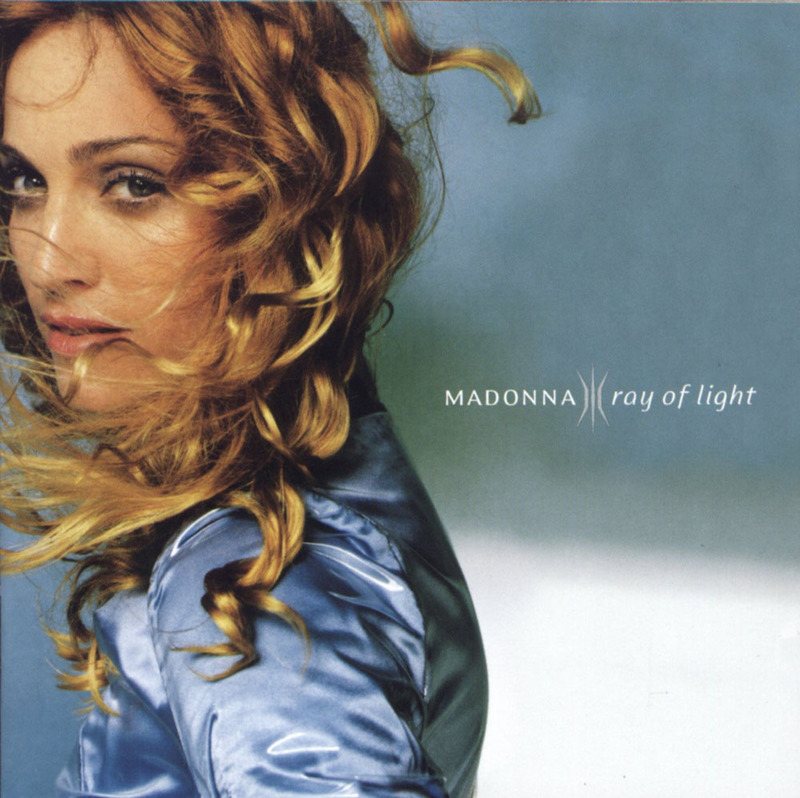 Ray of Light is probably Madonna’s masterpiece, and it came at the right time to bring her back into the mainstream, just as pure pop music was making a comeback after a few years of guitar dominated noises both sides of the pond. She probably owes the rest of her career to it. Of all Madonna’s albums, to my ears, Music has dated perhaps the worst. 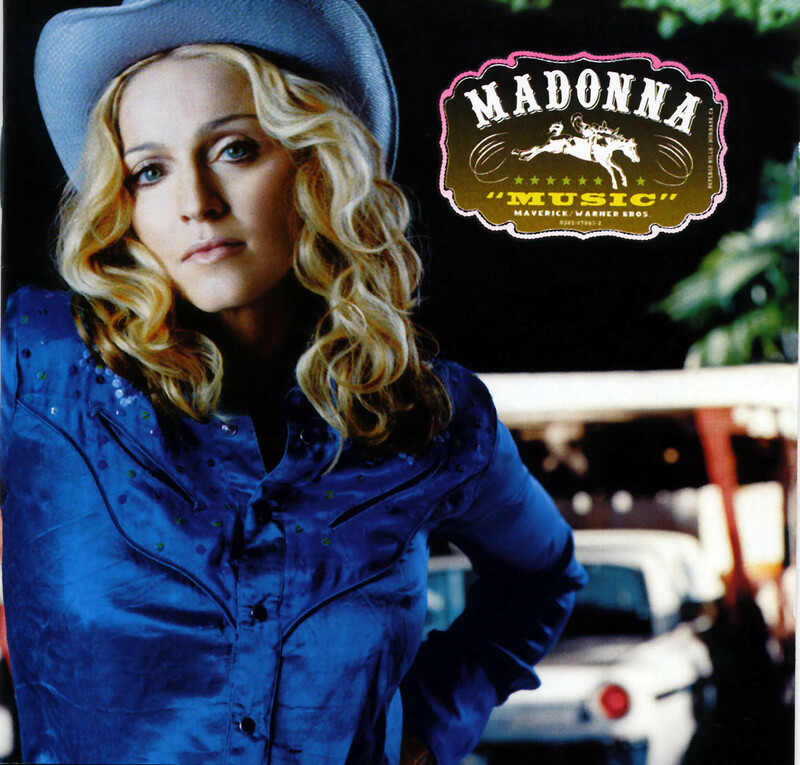 This might be partly because it is “my” Madonna album – I was 14 when it came out – and perhaps partly because of the things it is associated with – Beautiful Stranger (which came out the year before but popped up on various special editions) appeared in the second Austin Powers, Ali G popped up in the title track’s video, What It Feels Like For A Girl had a video for it which was directed by her then-husband Guy Richie. Whereas the elements from Madonna’s old albums that seem dated have perhaps gained some kind of nostalgic or kitsch quality with the passing of time, Music has not reached that level yet. But it was an enormous hit, and divorced of context, is mostly a big return to outright pop music. The title track song certainly was a big ode to pop music itself, although lyrically a bit messy (Music makes the people come together/music makes the bourgeoisie and the rebel) it works in the throwaway nature it was intended. Don’t Tell Me and What It Feels Like a Girl could easily have gone on Ray of Light, as could the following track in the running order Paradise. There is an fun but throwaway cover of American Pie in the mix too. And perhaps throwaway is how it was intended in the first place. Ray of Light was clearly Madonna’s most emotionally raw record (and all the better for it) but Music is a stepping away from that. There has always been a certain archness to Madonna – she’s always been the leader of the gang that is slightly cooler than yours – and Music achieves that archess, while shrugging off the emotional rawness of the previous. Madonna capatilised on the chart success of Ray of Light and Music by knocking out GHV2, essentially the sequel to The Immaculate Collection, filling in all the hit gaps between that collection and Music. Madonna appeared to be riding a wave of new popularity, especially with the early 00s rise of pop music indebted to her (Britney Spears, Christina Aguilera, *Nsync etc) but controversy can’t stay away from Madonna for too long, and American Life was her most controversial since the Erotica/Bedtime Stories era. The period kicked off with her Bond Theme, for the dreadful Die Another Day. No-one ever has a nice word to say about her title track for that movie, but I like it, a break from the bland self-parodic position Bond Themes had got themselves into by that point (can you hum some of the other Pierce Brosnan ones? Maybe The World Is Not Enough, but not the other two) but certainly the poor nature of the actual movie didn’t help. 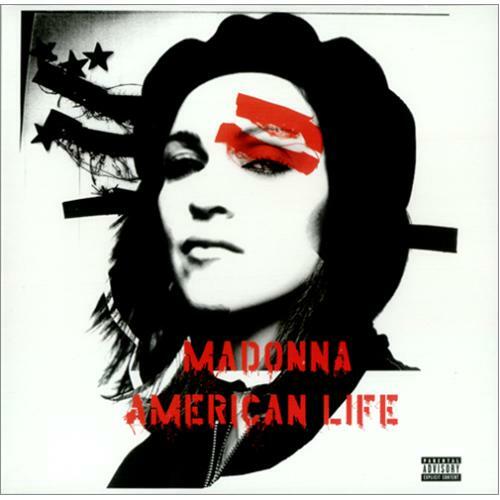 Then came American Life’s title track, a confrontational song about Madonna herself – all the thing’s she has tried to be and so on. It does feature a rap section featuring a bit about Mini Coopers which caused quite a lot of people to dismiss it, but it is certainly an interesting single. There was controversy with the accompanying video, which featured scenes of war – spectacularly for the first time Madonna capitulation and re-edited the video. The song (and in fact the whole album) also sought to damn the Material Girl reputation she had previously had, and had a down with money attitude as a whole. This sort of thing (by which I mean “rich people singing about how money doesn’t bring you happiness”) is never going to sit well with the masses who are going to point at how much money she does have. It’s easy for her to say, although Madonna herself was quite defensive on this point, asking “who better to say”. The American Life album sees Madonna apparently backed into a corner – which is odd considering the position she claimed immediately before. Perhaps it was the rise of the Britney’s and Christina’s (both of whom she performed Like A Virgin with in a memorable MTV performance) did make her seem more threatened. There is certainly a confrontational bent to American Life. I think retrospectively, American Life is neither the masterpiece you might want to reclaim it as, nor as bad as was claimed at the time. The main problem is that it doesn’t have as many memorable tunes on as her previous records. For Madonna’s fans though, it is a more interesting look at her psyche than Music was. Madonna followed the whole American Life controversies with a bizarre remix album (Remixed and Revisited) which featured four remixes from American Life, an old remix of Into the Groove and the MTV performance with Britney and Christina, it was an odd way to celebrate 20 years of releasing music. She would find her feet though, just as the faithful might have worried about her, with her underrated Confessions on a Dance Floor. After the politiking of American Life, Confessions is a return to Madonna embracing pop, and for the first time in a long time, dance music. The ABBA-sampling Hung Up was a brilliant jump-off track, and one of Madonna’s best ever singles. The same could be said of Sorry (which reached No 1 in the UK) which called to mind Madonna’s older disco work with a nod and wink (as opposed to Hung Up’s very much of-the-minute feel). The record is paced brilliantly. So often with albums about dancing, they feel a bit phoney and forgettable by the end, but credit must go to producer Stuart Price who pitches it perfectly. True it is Madonna embracing her own history two – Hung Up contains a nod to Love Song her duet with Prince, How High references two songs on Music, while Jump is meant to be a sequel to Keep it Together. In the 00s, a decade of postmodern consumption of the past (especially the 1980s) in a lot of ways, Confessions made perfect sense.It already, just six years on, seems a forgotten gem in Madonna’s cannon. Certainly her best record of the decade, perhaps its dancefloorisms have made it appear forgettable, but it is a record that deserves rediscovery. Perhaps the first album of Madonna’s where she feels out of touch. Whereas when Music embraced the modern, she seemed like a loved Godmother of Pop, by this point she appeared to have a mutton-dressed-as-lamb vibe about her – not helped by the odd album art. Still the young superstars qued up to appear on it – Justin Timberlake popped up on 4 minutes (inevitably a single) while most of the production was taken up by The Neptunes. Clearly this was an attempt to attract the “urban” market (the album was originally going to be called Black Madonna, before Madonna realised that this might cause some controversy. Something that wouldn’t have stopped her in 1988, clearly). If you can see past the obvious cynicism, and look past the production, which rather than being groundbreaking Madonna at her best, sounds like every other Neptunes produced record from the era, there is a decent pop record hiding underneath. 4 Minutes is in context of Madonna’s career, oddly leftfield sounding but a good pop song in its own right, Kanye West pops up for a memorable cameo on Beat Goes On, Miles Away sounds very much like a good pop single from 2008. But therein lies the problem. I suspect, a bit like Music, Madonna’s leaning on the contemporary for this album will make it date much faster than some of the albums around it. When she is at her best she has an oddly timeless quality, and I don’t think Hard Candy has that, it fills a gap in her career, but nobody involved in the album is doing the best stuff they have ever done. Madonna saw out the rest of the decade with various live albums and best ofs, apparently content to sit on her legacy. She went through a divorce with Guy Richie in the later half of the decade, which may (or may not) inform the next record, and has spent a few years putting together W.E, a film about Wallis Simpson. March will bring M.D.N.A, Madonna’s 12th studio album, and will see the return to the studio of William Orbit. Maybe it is too much to suggest those ingredients are going to produce another Ray of Light, but another good Madonna album will make the world a better place.